Holy Shrubbery! Try These Ideas Out for Improving Your Landscape. How lonely and awkward a home feels without a thoughtfully arranged landscape of shrubs and trees. Finding the right kinds that fit your landscape style, that mature into a size in proportion to the area, and are hardy in our area, can sometimes be trial and error. Here are a few plant suggestions that are hardy in central Ohio. 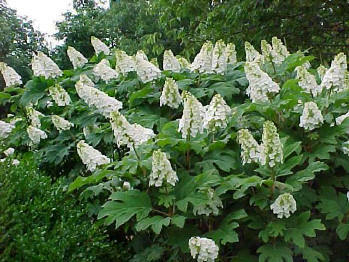 They are relatively new breeds in the gardening realm, and can create a spot of beauty in problems areas. The High pH Soil Sufferer: Without a lot of soil amending, growing acid-loving plants like Rhododendrons, Azaleas, and Hollies is an exercise in frustration. Why not try some alternatives! Combine evergreen Boxwoods, with pink or white blooming hydrangeas for amazing summer bloom power. The amazing Incrediball™ Hydrangea has blooms up to 12” across. For something smaller the Cityline™ series of Hydrangeas will give great blooms in a compact plant. The Living Fence Privacy Project: Skinny yard, close neighbors. They’re nice people, but geez, so close! 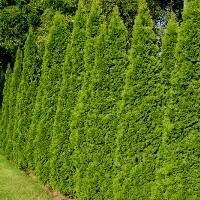 Is a line of Emerald Green Arborvitae the answer? They’re tall and skinny, but don’t forget to water them. How about a tall hedge of Citation Yew shrubs. They’re evergreen and very attractive. Are you adventurous? How about a wood lathe trellis planted with Hydrangea vine? In a few years you’re rewarded with a rich wall of foliage each season and a summer of gorgeous blooms. If you have a larger area to work with, there are many more cool possibilities. The Shade Garden Searcher: A shady area full of large trees and clay soil is a difficult area because in most parts of Columbus, many shade loving shrubs are acid loving plants and tough to grow. A grouping of Snow Queen Oakleaf Hydrangeas provides summer blooms with a bonus of beautiful fall foliage color. Virginia Sweetspire “Little Henry”™ is a good small shrub that looks great when grouped. 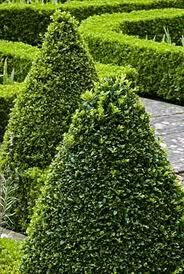 Also, try the many forms of Boxwood. There is always that ‘tough spot’ to figure out in the landscape. Let the experts at Oakland help you with informed and imaginative solutions.